Welcome, friends, to Hebraic Christian Global Community! Something truly profound is happening! In what can only be described as a sovereign work of the Holy Spirit, Christians around the world are now working to restore the Hebraic foundations of the Christian faith. After being marred for eighteen centuries by Judeaeophobia, anti-Judaism, and Antisemitism, the church is being impacted by a revolution of restoration. From virtually every nation, ethnicity, and denomination, Christian scholars, clergy, and laity are reconnecting their faith in Jesus with its historical Jewish roots. These Christian believers represent an untapped dynamic force that needs to form a more consolidated witness to the truth about Christianity’s long-obscured biblical foundations. Enjoy the amazing array of resources for Hebraic truth that are now at your fingertips. Experience the interactive environment where you can discover, experience, and practice Hebraic truth. Explore the resource center that equips you with the Hebraic truth of Jesus and the apostles. Join the growing family of subscribers to Restore! magazine, the world’s finest journal teaching the Jewish roots of the Christian faith. Subscribe today, starting at $35/year. 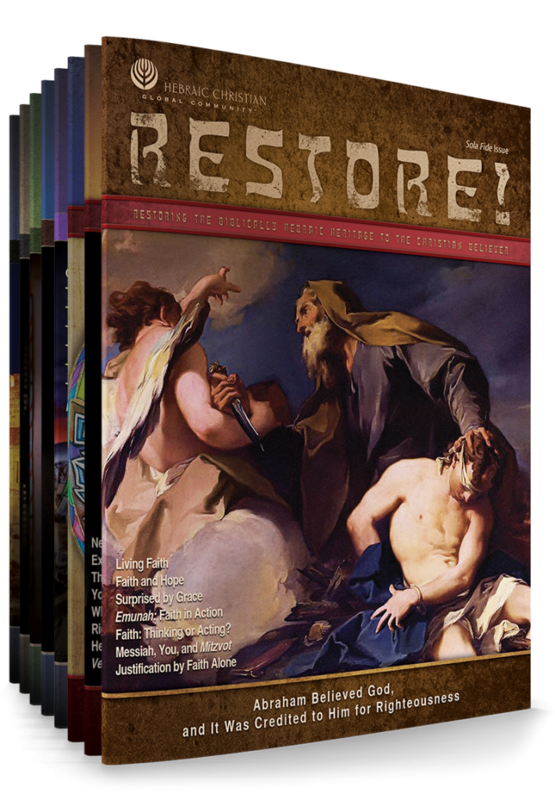 All the issues of Restore! are available either as hard copies or as PDF downloads. Preview the issues and order the ones you need, starting at $4.99 each.